I just had the most incredible massage session of all time with Igor. I travelled 1.5 hours from Vancouver to Coquitlam by bus, but it certainly did not disappoint. My ankles, knees, back and neck muscles feel like new, I literally bounced out of the clinic. 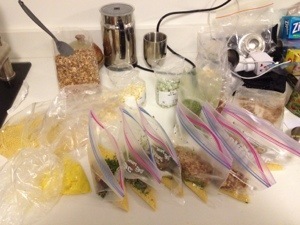 Last night I prepped meals like a woman possessed. 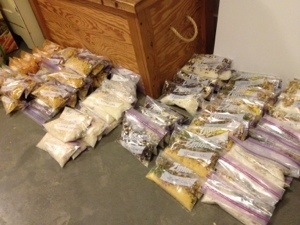 My target was 85 dinners and when I was done around midnight I counted 101! The more I do now, the less I need to do on the trail. 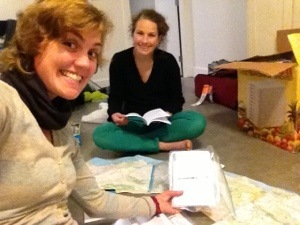 Sarah and I are going to take a look at each resupply today and move things around. She thinks I’ll have too much to begin with but eventually it’ll be about right. 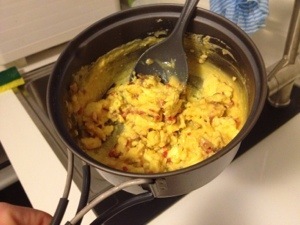 I had powdered egg with bacon bits and dried pinto beans at 6:30am this morning. For powdered eggs they were pretty good but I wouldn’t rave about them. 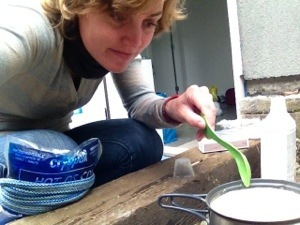 Plus they really stick to the pan, so I think I’ll stick (no pun intended) with what I’ve got. I’ve spent the entire day in the kitchen prepping meals apart from the hour break where Sarah and I went to IKEA and Famous Foods for my final supplies. 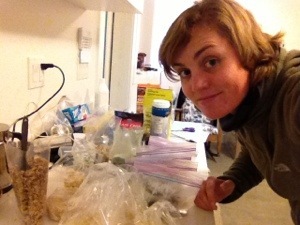 It’s like a hiker food sweat shop in here, churning through meal after meal in the aim to reach at least 85 dinners to get me through to Echo Lake. At the moment I’m listening to Fleetwood Mac while preparing Vegetable Cous Cous. I tried the meal this evening and apart from the quantity being too small the rest tasted great. Even Sarah’s daughter Maia sampled it and gave a giggle of approval! On my last count I’d completed 44 dinners, at least I’m halfway! Tomorrow I’m escaping the kitchen for a few hours to see magic hands Igor for my back and then coffee with a friend downtown. Then it’ll be back to the sweat shop for final prep and boxing. 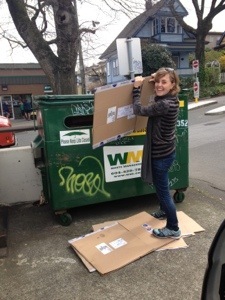 Hopefully the boxes I found in a recycling bin will be a good size for resupply! 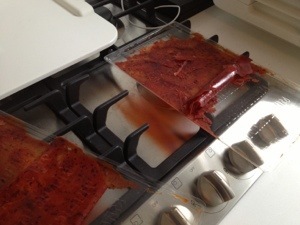 I’m not exactly sure how Sarah made it look so easy, but my attempts at dehydrating pasta sauce haven’t been as successful! 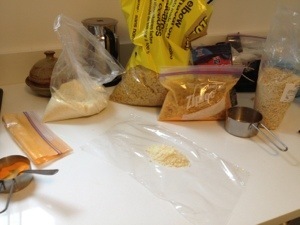 Instead of coming off the trays in one clean sheet, mine are cracking and breaking into small dehydrated pasta flakes. Most of the sauce is simple stuck to the tray and won’t budge. I have four days of food prep left and I’m starting to feel the pressure. The sauce I’m making now was supposed to be sent to Echo Lake with a heap of other left over food that I’ll repackaged in South Lake Tahoe for the Oregon leg. 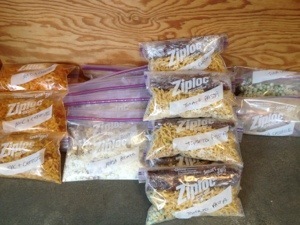 Then in Ashland I plan to prep my food for Washington. I still have a lot of work to do on dinners. Anyone who knows me understands how pathetic my attempts at cooking dinner are, rather I simply don’t attempt it at all. The thought of circulating through five different dinner meals for months on end makes my stomach turn already. 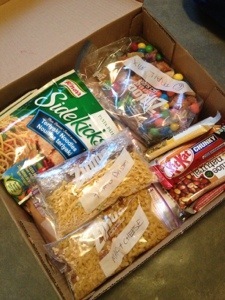 Hopefully mixing it up with Knorr’s Sidekicks and other prepackaged goods will help keep up the variety! I finally got back on my feet yesterday and walked close to 14km downtown to see Igor, my back guru. I was hoping for a miracle and he came pretty close. After some serious massage and cracking my back is feeling a LOT better. He found a few other sore spots in my groin, knees and ankles which he paid some attention to. I honestly want to marry this bald Russian man’s magic hands! 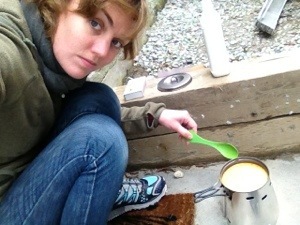 After dropping off a Tim Tam delivery for my mate Jessie I was back at Sarah’s testing out the tuna casserole. I was feeling utterly under the weather yesterday, and after setting off the smoke alarms by burning about a centimetre to the bottom of my pot I couldn’t even muster a photo! Above is a picture of the casserole contents: minute rice, freeze dried peas, powdered cream of mushroom soup, salt, then add tuna (which I need to buy in the US). 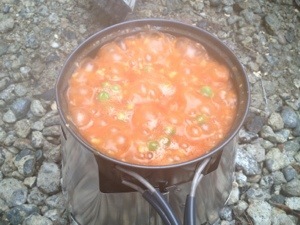 Then today it was back to using my stove in the backyard to make pasta with dehydrated tomato sauce. 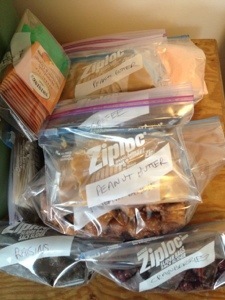 I added powdered parmesan cheese, soy protein, onion flakes, freeze dried peas and salt. 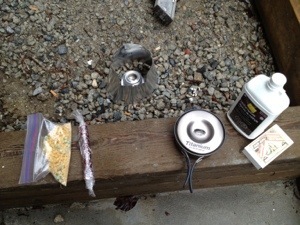 I used 2 TBS of Methyl Hydrate for fuel and 400ml of water in my pot. I was multitasking by cooking and icing my knee at the same time. I need to put a cold compress on my knee for 5 mins, then hot for 5, then repeat that again twice. It seems to have helped. 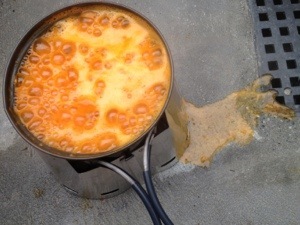 The result of the meal was more like a soup but non the less delicious! I may decide to try a creamy pasta sauce for the next one! 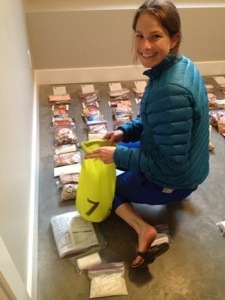 With all the food testing and tasting I’m doing at the moment I’ll have no trouble stacking on the kgs before the hike! The question is, can I still move? Tomorrow I’m walking 5.5km downtown to see if my old Russian back specialist can perform a miracle and stop the pain. 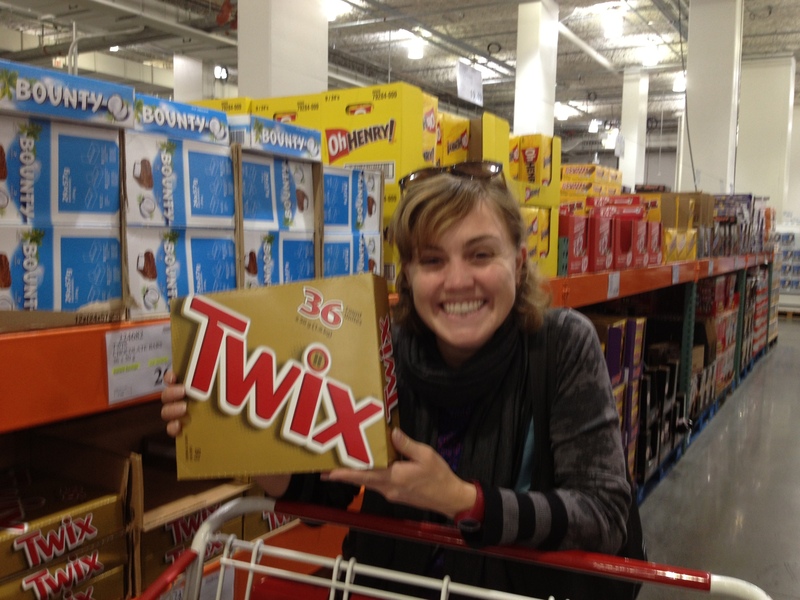 Pretty damn excited about large quantities of chocolate! 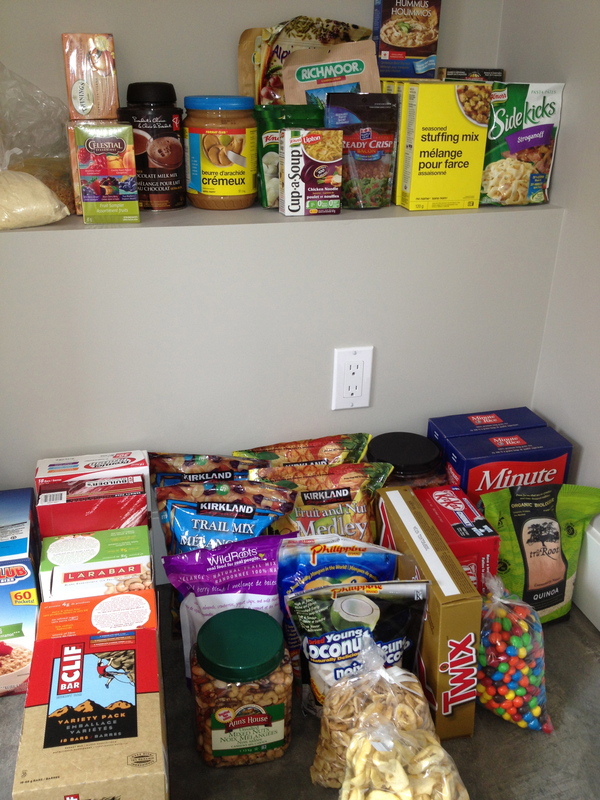 The highlight of my day was our trip to Cosco where I spent $289.91 on all sorts of goodies including mass quantities of chocolate, protein, muesli and nuts bars, trail mixes, oats and quinoa. We got lucky at the checkout as Sarah’s membership had just expired but the kind manager must have seen the desperation in our eyes and thought we were hungry! 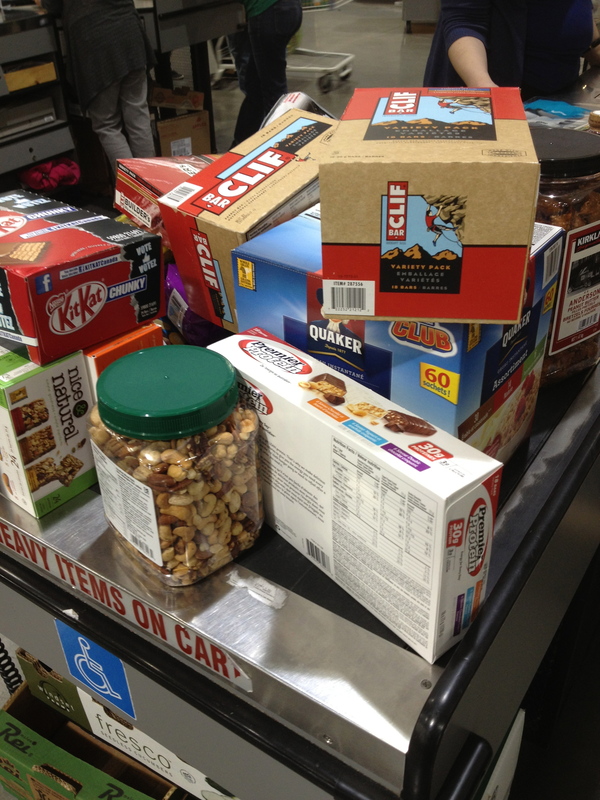 My pile at the checkout. 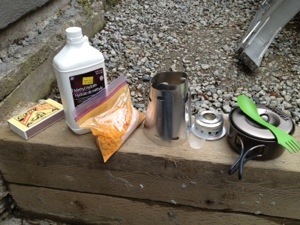 We also swung past Save-on-foods, London drugs for toiletries and Mountain Equipment Coop (MEC) for a few final pieces of gear (whistle, bear bell, SPOT device, rope, underwear, spoon, spork, bug head net, compass etc). 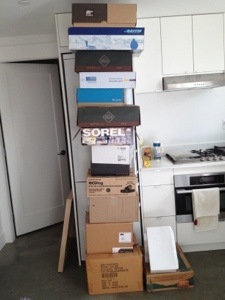 Sarah’s dad was also over at her place this morning. 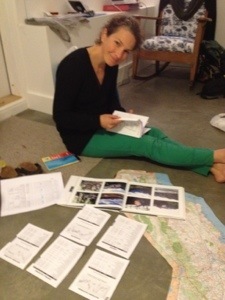 He shared photos and stories of his time with Sarah on the trail. They almost made it halfway together before he headed home and Sarah carried on solo. Both of their excitement when they reminisced about their experience made me all the more excited about getting out there. 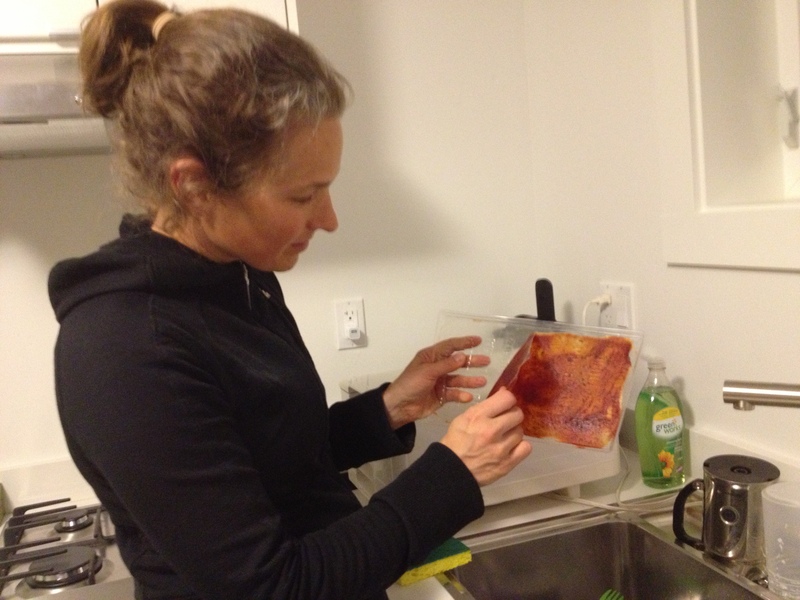 Sarah peeling off dehydrated pasta sauce made in about 12 hours. 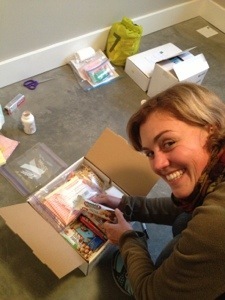 Sarah set me the task of preparing my nine food boxes up to Kennedy Meadows. 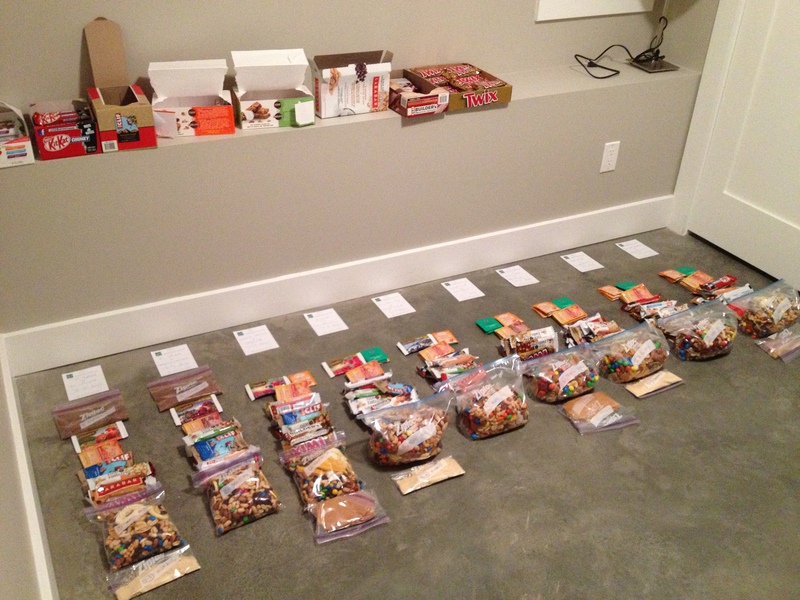 I was able to sort out drink powders, tea, coffee, bars, trail mix, peanut butter and hummus. 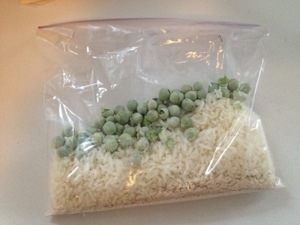 Tomorrow I’ll start on breakfast and dinners for each day. 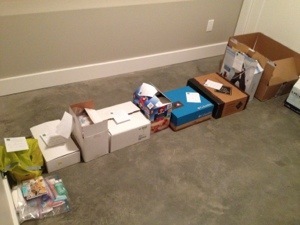 Laying it all out in piles made me realise just how much I’ll need to carry. 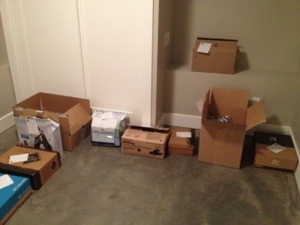 The first 9 of 26 boxes to prepare, still without breakfast or dinner. I tried another meal tonight, mash potato with stuffing, dried onion flakes, bacon bits and gravy. Not bad at all. It went down well with a cup of iced tea and some banana chips and peanut butter for dessert. 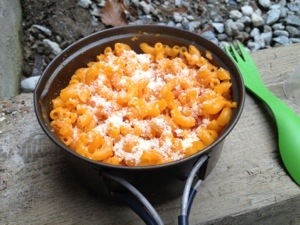 I hope I don’t get sick of trail food before I start! 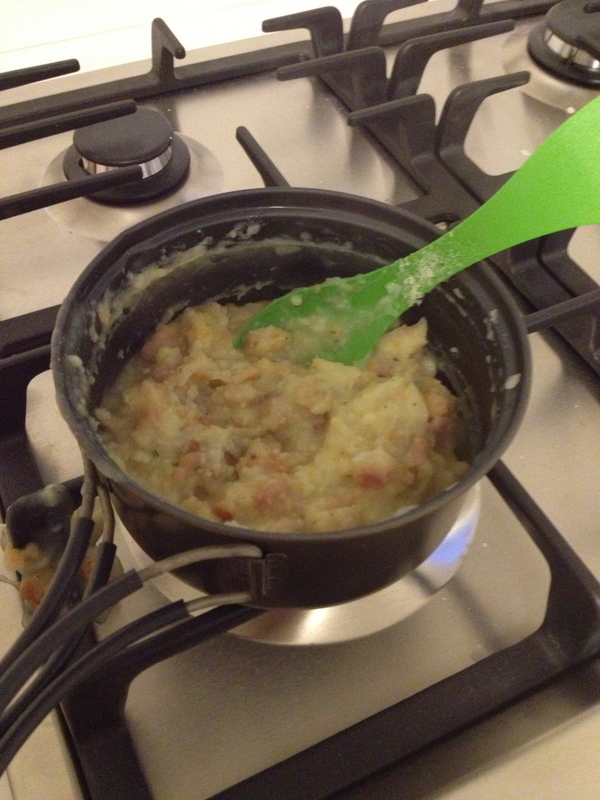 Delicious mash with my new spork.